Former home of John G. Westerfield. The building was the site of the William H. Scott Mortuary at the time the photograph was taken. 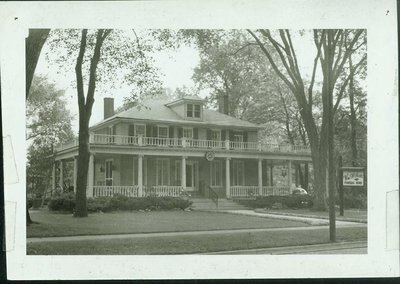 In pencil on reverse, "First house of Wilmette founder, John G. Westerfield, 1118 Greenleaf Ave." Stamped on the reverse: "Thanks for credit Rebecca Fitch, photographer, Wilmette. October 15, 1953"